Description: Learn just about everything there is to know about sending and receiving Email in Access. Versions: I will use the 32-bit version of Access 2013, however most of the topics will work fine with any version of Access. The common dialog box (used to select a file attachment) will not work with 64-bit Access. The lesson on disabling the Outlook security warnings may not work in older versions of Office. Almost everything else works just fine. Watch the intro video (above) for a complete list of version information. Pre-Requisites: This course stands alone, however it is very strongly recommended that you at least know everything in my Access Beginner series (1-9) and the first three lessons of my Expert series. You will also need an email account and a working installation of Microsoft Outlook to use the lessons involving Outlook. If you wish to use the lessons on collecting data via a web page, you will need Microsoft web hosting. Again watch the intro video (above) for a complete listing of pre-requisites for this course. There are four major goals for today's class. You will learn how to send email with and without using Microsoft Outlook. You will learn how to send bulk email batches to groups of customers on set mailing lists using plain text, rich text, or HTML formatted emails. You will build a separate email server database whose job is to handle the processing of email for all of the users on your network. You will learn how to extract data (including attachments) from incoming emails using Outlook, parse the data into your Access tables, and save attachments to your hard drive. You can download the database that is built in this class so you can test it and make sure it's right for your needs. Click here to download (Access 2013 format). Important note: in the preview database, only the forms that send email via Outlook will work. The SMTP (non-Outlook) code will NOT work because you need to edit the source code and specify your mail server settings, username, and password. These features are only available in the FULL database (which you get a copy of when you buy the seminar). You will start by learning how to send email from Access using Outlook by sending reports from your database directly to a single email. You will learn about the SendObject and EmailDatabaseObject macro and VBA commands. We'll talk about the Outlook Security Warning and what it means. 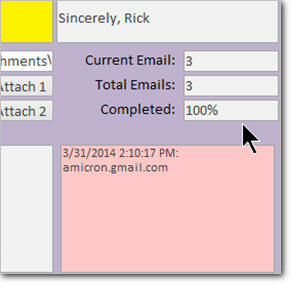 You will learn how to create nice, formatted emails using Microsoft Word. 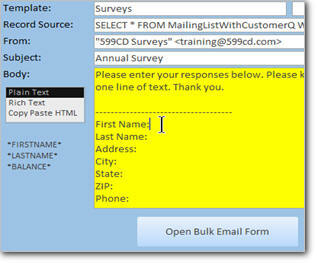 We will use our Access data in a Word Mail Merge to send multiple emails using Outlook. You will learn about inserting pictures, hyperlinks, and more. 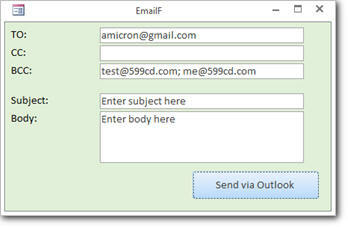 Next we'll build our own email form and send text email direct to Outlook without having to use a database report. You'll learn about the Outlook Application Library and how to add a reference to it in your VBA editor. You'll learn how to send formatted, rich text and HTML messages direct to Outlook. We'll see how to upload images to a public folder on the Web so that your recipients don't have to download them in their email. 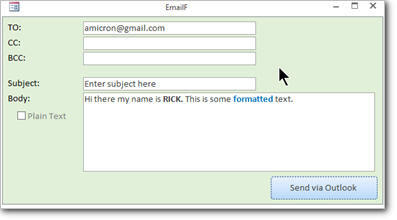 Next we'll create a separate form for sending HTML formatted emails. 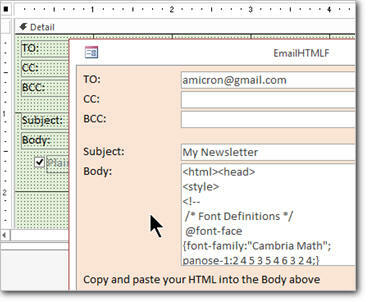 The concept is to create an HTML email in a web editor (or even Word, saved as HTML). 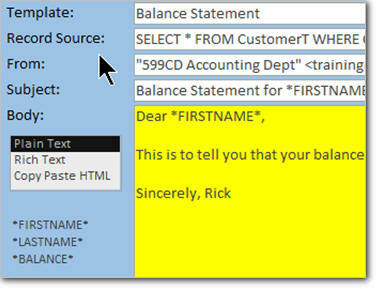 Then we just copy and paste the HTML code directly into our email database and click send. You will next learn how to send attachments as part of your emails via Outlook. We'll create ZIP files, check if a file exists, use the Common Dialog DLL to click on a "select file" button and browse for the files to attach. Next we will see how to automatically export an Access report as a PDF file using VB code. We'll save these PDF files to a folder on your hard drive, and then use them as attachments in outgoing emails. Great for sending customer statements or invoices. Now we'll start learning how to send bulk email using Outlook. We'll create a customer list form, select specific customers to mail to, generate a loop to cycle through each of the customers, and send email to the selected customers. I will also show you how to disable the Outlook Security Warning so you're not prompted each time you send an email. We'll send balance statements to all customers with a balance on their account over zero dollars. Next we'll begin a series of lessons on sending email without using Outlook. We will learn how to connect directly to an SMTP mail server. You will still need an email account with an Internet provider, but this will allow you to send directly to their mail server using Access directly, without needing an intermediate program like Outlook between you. We'll learn about the Collaborative Data Object (CDO) programming library. 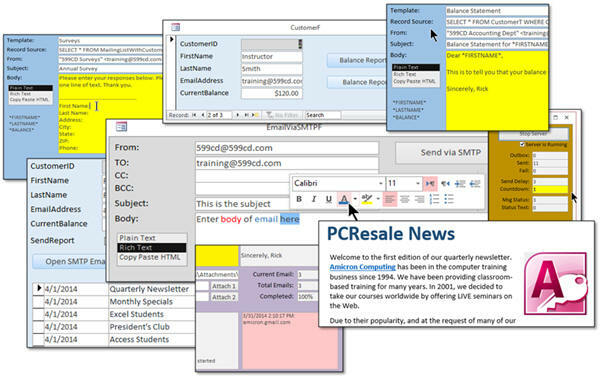 We will build a more robust form for sending email. You'll be able to select the format (plain, rich text, HTML), specify CC and BCC recipients, and more. Next we will learn how to connect to Gmail to send mail using SSL (Secure Sockets Layer). We'll also learn how to send "friendly" names on our emails. 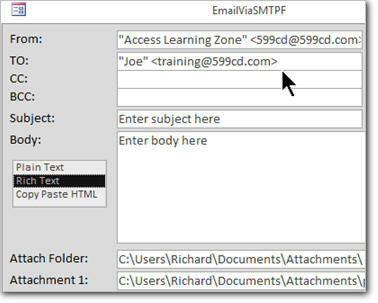 You will learn how to send email attachments using this method. You will also lean how to handle errors during the transmission of the email to the server. You will learn how to create an email based on a web page or HTML document. If you know a little bit about web editing, you'll be able to set up a web page, format it as an email (newsletter, for example) and then with a few lines of code send that out as an email, automatically. Next we'll learn how to use Recordsets to loop through the records of our database in VBA code. This will allow us to more easily send large batches of bulk email. We'll create our own Merge Codes in our emails so you can customize them with phrases like "Dear *FIRSTNAME*" turning into "Dear Joe" when the email goes out. We'll monitor our email statistics, so when you're sending a large batch you can see how many emails there are total, how many are left, and what the percentage of completion is. If you're sending a large volume of emails, you may want to space them out so you don't bog your mail server down. Some ISPs also will complain if you send a ton of emails at once. 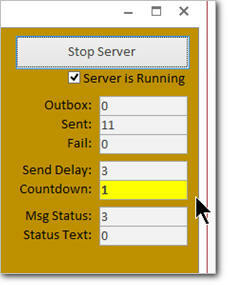 I'll show you how to program a countdown timer with a delay so you can space your emails out. This will also prevent a flood of traffic on your web server if everyone responds to your email at once. You'll probably have certain emails that you'll send on a regular basis, such as monthly newsletters, weekly balance reports, and so on. Instead of having to re-invent the wheel every time, we'll make a table/form to save our Email Templates. That way you just pick the template, select the customers, customize it a bit if you want, and then click SEND. You'll also probably want to put customers into different mailing lists, such as your company newsletter, monthly specials, or in my case a group for my Excel students, another for my Access students, and so on. We'll set up a category system where each customer can be in one or more categories. Now all you have to do is pick the Template, pick the Category, and all of those customers get their emails, automatically. Sending a large batch of email can take a long time. 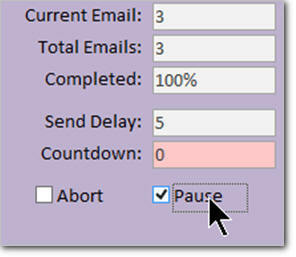 If you have 20,000 emails to send out, that can busy your system up for a few hours. It would be nice to queue up the emails and have another database send them out, right? This can even be a database sitting on another computer somewhere on your network... one that everyone on the network can use. In this lesson I'll show you how to set that up. To be clear, this "database server" will collect the emails from users and send them up to your Email account. You will still need an ISP and an email address. This database just handles all of the email transmission processing so you don't bog down your workstation PC. Next we will learn how to read incoming emails and extract the data from them. We'll see how to loop through the emails in our Outlook inbox, collect the data from them, store that data in our Access tables, and put the data in the right fields. We'll see how to send out a User Survey via email and process the data when the users return the email with information filled in. If you have your own web site with Microsoft (Windows) hosting, this lesson will allow you to set up a form on your web site using HTML and ASP (Active Server Pages) to collect user data. When they submit the data it will come to you via email and you can use the techniques from the previous lesson to read and parse the data. 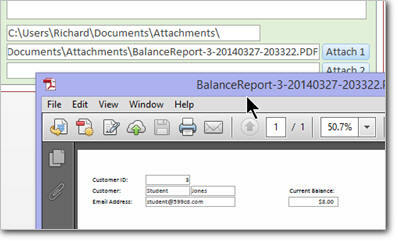 Many people use the Attachment field type in Access databases to store files. I will show you how to extract those files to your hard drive using VBA code so that you can then use them as email attachments. We will also discuss tracking email deliverability with delivery status notifications and read receipts. We'll talk about sending email as text messages using an SMS gateway, and we'll see how to extract attachments from incoming emails and save them to a file folder. As you can see, if you want to be able to send and receive emails using Access, this is the perfect seminar for you. You will learn everything mentioned above. You will have access to the full database that we build in class with all of these features. If you have any question whether this seminar is right for you, please feel free to contact me. Richard on 4/5/2014: The Microsoft Access Email Seminar will teach you just about everything there is to know about sending and receiving email using Microsoft Access - with or without Microsoft Outlook. This seminar is for the intermediate to advanced Access developer. Topics include: - Send Email Using Outlook - Export Access Reports as PDFs - Attach Files to Outgoing Email - Disable Outlook Security Warnings - Mail Merge Using Access and Word - Create Rich Text or HTML Email - Include Images in Emails - Broadcast Bulk Email Batches - Send Email Without Outlook - Connect Directly to a Mail Server - Create an Email from a Web Page - Embed Custom Mail Merge Fields - Add a Send Delay to Large Batches - Build Regular Email Templates - Assign Customers to Mailing Lists - Construct a Mail Server Database - Acquire Data from Incoming Emails - Build a Web Form to Collect Survey Data - Extract Files from Access Attachments - Track Email Deliverability - Email to SMS (Text Message) Gateways - Extract Attachments from Incoming Mail Click here for more information on the Microsoft Access Email Seminar, including a complete course outline, sample video, sample database file, and lots more. Jim, of which code are you speaking? Nothing on my site should be different in the UK. Jim U on 4/10/2014: I don.t seen able to access any of the code for copying and. Pasting. I am just getting error message page cannot be displayed. I have tried it at to locations. I just tested it, and it's working fine for me. What is the EXACT error message you're getting? Is it a web 404 error, or is it an error my site is giving you? Robert Miller on 4/15/2014: Rick, LOVE LOVE LOVE this seminar!! I already have tons of ideas that I want to incorporate into my databases. Question: Will you be creating a handbook for this seminar? Or do you just have handbooks for regular lessons? I would like to get my hands on a paper copy of this seminar so that I can use it for references without having to log in all the time to review a video. It would be greatly appreciated! Thanks again for an awesome seminar! Larisa K on 4/23/2014: Hi Rick- Thank you so much for such a good seminar. But I need your help, I can't access to my gmail account. it show me only one general error "overflow" which is hard to figure out where is the problem. Is any way I can specify error description to see what's wrong? Do you have two-factor authentication turned on? If you have an Android phone you might have the Authenticator app which gives you a code to get into your Gmail if you lose your password. If this is the case, you need to set up a special-access password to connect to Gmail from other programs, like your Access database. See this article on Gmail two-factor authentication. Larisa on 4/23/2014: thanks for your response. I don't have two-factor authentication. it says disable in my security setting. I did search on-line what could cost this problem but nothing help me. Any more ideas? You've got me. I've got a couple of different Gmail accounts, and this technique works fine with all of them. Anyone else? When testing my VBA code at the end of lesson 7 I found that if the MsgAttach1 and MsgAttach2 were blank I would get an error message. After some thought I decided that as we were now using a button to select the file to attach the dir code lines were no longer relevant. MsgBox "Attachment 1 does not Exist"
I'd appreciate your thoughts and any suggestions for improved code. I'm appreciating the seminar and slowly learning VBA code. Great stuff. Attaching a file works fine. Please advise on how to convert the entire file location string into a hyperlink using vba so that on a double click the user may open and view the file. Larisa K on 5/19/2014: I just finish updating my program with this seminar. I can t say enough thank you!!. You are the best teacher I ever had in my live. So easy to follow you and understand. You topics always going wider than I expected. Every your new lesson is 100% important. Thanks so much!! Waiting for your next seminar, I am looking for seminar which will show how to upload database on web server and work from different pc-locations to get the data. Andy Treusch on 6/3/2014: when i attempt to run this msgbox the subject in the inbox i bomb out in the loop with "New or Modified User Account Information". It does not show the subjects. I do have three accounts in outlook. I am having difficulty with an two fields on my importing of text from an email. I have two fields, one is called Name: and the other is Company Name: my error is that Company Name will populate my Name: field in the database (actually the title of the field is TeacherName:in the db). Do you have a suggestion for code that will improve this? Or a direction of which course will help me to figure this out? Thanks so much! If this is an import you have to perform on a regular basis, just specify the field names in your Import Spec. If it's a one-time thing, just correct them after you import them into a temp table, then append them into your main table. Gie on 7/29/2014: Will this seminar include how to set-up the sender email? I am using 2 outlook email accounts, one my own email and the other a group email or shared inbox. I want to be able to send using the group email. The seminar doesn't not specifically cover setting up your email accounts in Outlook. It's assumed you have a working copy of Outlook and you have at least one account set up. Once that's done, Access will use your DEFAULT Outlook email account to send all of its mail. Kaylen D on 9/19/2014: Lesson 1, I tried both the macro button and the vba method to open a specific report for a record in a form but getting the same error Runtime 3211: the database engine could not lock table 'tblContacttypes' because it is already in use by another person or process". Fyi, the form has two subforms attached to it. Scott Adkins on 10/29/2014: Richard I am running Windows 8 and Access/Outlook 13. I changed the suspicious activity warning exactly as in the seminar but I still get that stupid allow/deny message. Is there something else that needs to be changed? Did you make sure you made the change while logged on (or at least running the program) AS ADMINISTRATOR? Aside from that, I pretty much covered everything in the seminar. Personally, I don't like using Outlook to send Email. The lessons on using Gmail (or another SMTP server) are my preferred method. Scott on 11/3/2014: I played with it for a while and learned this. If you try to send with a macro, you get that security warning. If you do it with vba, and follow the steps in the seminar, then it works fine. Arabi Mahmood Moodi on 11/28/2014: where can i find source code page ? i have introduced outlook on my computer to day for for sake of outlook mails ,and it has been the my first time to try it on mails but why is it that all emails i send do not go to my old yahoo mails? but i just receive them on outlook mail account i have just created ? now how can i send to people on Google and yahoo through outlook? Which account did you use with outlook? It should be able to send to any email address. i meant source page code for SMPT Savor, and others. therefor can you please help and put all these indexes near ? i can receive incoming email with this account on outlook from my database but nothing goes in yahoo account of the same account why ? Ah so you would like the VBA code Rich uses, have you downloaded the Sample Database? You can also buy the Handbook, I add all the code to these so you can copy/paste them into your own database. So if you log into your yahoo account in a web browser are you not seeing emails? If they are coming into the the db it means they are in your account. this is because my account is registered with yahoo. jeff horvate on 12/5/2014: when I go to build event, it go to vba mode, I want macro mode? I got office 2007. Does your Event already have [Event Procedure] beside it? Try deleting this then clicking the Ellipse(...). This should then pop up a Builder options. If this doesn't work you may have changed your settings to not always use code. Select Object Designers from the list. Scroll down to the Forms/Reports section. Click on OK to close the window. Tony Roberts on 12/29/2014: HI, thanks for the course, the best I have seen. I have been trying to insert a new line in the MsgBody after pulling the person's name so the the message is not all on the same line. I have tried the usual commands but it will not produce a new line. Can you advise? Hi Tony what commands have you tried? not the same as ""
as I was using a richtext text box. Kath McLeod on 1/13/2015: Hi Richard, in completing Lesson 7 if find that when i click on the Attachment 1 or 2 buttons the Attachments folder opens up, I choose a file and am returned to the form but no attachment is loaded. I have checked the VBA and it all appears fine. Could you please advise what I am doing wrong. If i cancel without selecting a file, i get the "A file was not selected" error message. So that is working fine. I am reluctant to move on with the lessons until i can work this one out. Is the Field on the Form the name that the functions passes back to. That will need to match the Textbox on the Form. MsgBox "The file you selected for an attachment does not exit!" What part are you typing and what error are you expecting to be caught? Kath McLeod on 2/12/2015: Alex this is the code MsgAttach1 = Selectfile(Me, AttachFolder) which is the same as Richards. Also I downloaded Richards and it works perfectly. (i thought is may be because i have windows 64bit but if Richards works it is not that. I need to get this working so i can move on. Any further suggestions? Do you have Office 32-Bit installed? What happens when you press it? If I want to use the Email Merge to Word and I have a few email accounts in Outlook, how do I choose the correct "From" email address? You'll have to create a profile with just one account, not multiple and choose that one. I am trying to make various buttons in my forms that send out a template email - text is always the same and just takes (firstname)or other details from a candidates record. "we would like to invite you " "." Tried all andcannot figure it out. The body of each message is like 6/7 lines of text + signature. Is this the way or is there an easier solution? Have you seen Lesson 19? Steffen Morning on 7/3/2015: Very interesting class and it shows almost what I need. My problem is that I wish to import and move ONLY the currently selected e-mail in Outlook and not all of them. I figure a simple change to the line "For Each oMailItem In oInbox.Items" would do the trick but I don't know how. Can I simply change the word "Each" to "Selected"? I'll need to look at the code. For Each is a keyword used in the loop, it's the oInbox.Items that would need to be checked for first. Ray White on 8/31/2015: If I am using Outlook 2010 reference in my VBA when developing my program and then send the program out to my users will Outlook 2010 version be the only version that will work with the program or will any version that the user has will work? Kim Beaul on 12/10/2015: I'm having problems with Mail Merge. When I click on Mail Merge when I have a query open with the data I want to include in the email Word opens with pop up dialog box "confirm data source" with OLE DB Dabatabase Files as the only option. When I click OK the icon for Access starts flashing in the task bar with pop up message "Word was unable to open the data source" Do you have any idea why this is happening. Right now my work around is to export the query to excel and then use it as the data source for my mail merge. I'm only on the 3rd video so I'm sure one of your other email methods will meet my needs better but I would like to know why I am getting this error. Does your Query contain a Parameter? Did you try the suggested article? Ray W on 12/22/2015: I don't understand how this works? Wayne Markel on 12/24/2015: Lesson 9 - Time 23:33 I set my Outlook Program Access Security to "Warn me about suspicious activity when my antivirus software is out of date" Works to suppress warning message in Access. Isn't this a better choice than "Never warm me...."? It's your choice, whichever you feel most comfortable with. Wayne Markel on 12/24/2015: Lesson 10 Time 20:05. I have an email with Godaddy and it work fine, I have email with Yahoo and it works fine, But Gmail and Hotmail will not work, I have tried every option they are with not luck. Are there any setting in the Gmail or Hotmail account that I need to set? GMAIL now needs you to lower your security settings. I think it's this setting - Google page. There's probably a similar setting for Hotmail too. That did work for Gmail. strEmails = strEmails & EmailAddress & ";"
Jerry F on 1/13/2016: Thank you! Your awesome! This is what the code ended up looking like, and I have ran it on multiple tables now to get emails, but how does strEmails "know" what it's value is. It is dim'd @ the start of the code, but never "set" to = anything....I appreciate your help, just trying to understand the "why" behind what I did. You set it here with the assignment operator "="
Jerry F on 1/13/2016: Great! Again, thank you so much for your time and information! Greatly appreciated! Ray White on 1/28/2016: I am trying to run a Bulk email from my Agents data form with a Criteria By "Department" say just email everyone in the Billing Department. I have this in my Bulk Email form on open. Is Department a String Field? MsgRecordSource = "SELECT * FROM qryAgentContact WHERE Department='" & DepartmentName & "'"
" SELECT * FROM qryAgentContact WHERE Department='Finance' "
Such a little things can be so hard to figure out sometimes. All of these videos are the best training I have ever purchased in 15 years. To date you have completed 46 hours for your field placement at SAM Program (East Site). By the end of the week of Feb 1 - 7 64 hours should have been completed. If you are short of hours or have any questions regarding your hours please contact your Field Placement Specialist Julie Pollock julie.pollock@mohawkcollege.ca (905) 575-1212 Ext. 2033. My boss would like the lower portion to be in a table. 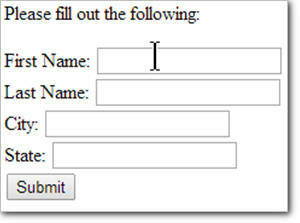 Forms!Email_Form_StudentFieldPlacementHours_HTML!MsgBody = "Dear " & Fname & "
" " & FPSE & " " & FPSPhone & ". Are you comfortable writing HTML? Kim Beaul on 2/13/2016: RE: Table inside email message. I figured it out!! Forms!Email_Form_StudentFieldPlacementHours!MsgBody = "Dear " & Fname & "
" " & Week1Comment & "
" & Week2Date & " " & HrsWeek2 & " " & Week2Comment & "
" & Week3Date & " " & HrsWeek3 & " " & Week3Comment & "
" & Week4Date & " " & HrsWeek4 & " " & Week4Comment & "
All I need now is to indent the table about 1-2 inches. See this Glossary item for others. James Gray on 2/26/2016: Outlook 2016 seems to add "mailto:" to all hyperlinks. In my code, when it looks up the specific email address to send objects to, the email address turns into the original email from the database#mailto:email address from the database#. Outlook then errs out, not understanding that to: email address. I am unable to edit this mailto: out of the address in the editor. Interestingly, any email address I entered using older versions of access seem to work...Any clues as to how to fix this? Which part of the db is doing this? 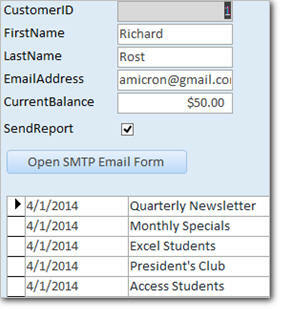 Using the macro to set the values for EMailDatabaseObject parameter To to [Forms]! !, the To on the message field appears as #mailto:#. Is there a value in the form control? James Gray on 4/20/2016: Just a quick note: I was having trouble getting the "minimum code" to function properly. I was getting a "transport not connecting to server....error. I googled the error and finally came up with a line of code to add to the minimum and it seems to eliminate the error. That line of code is:msg.Configuration.Fields.Item("http://schemas.microsoft.com/cdo/configuration/smtpusessl") = True. Everything now seems to work just fine. I am using Office 365 and Windows 10. Thanks. James Gray on 4/21/2016: It looks like the statement for adding attachments in now Msg.AddAttachment filename instead of Msg.Attachment.Add filename. Maybe a change in CDO language in new Office 365? Chris Thompson on 12/29/2016: FYI, 2010 Outlook has the same Programmatic Access Security as 2013 Outlook used in your video. The available options are identical. Do you go through sending a mass email without attachments? I have a database that contains 400 emails and I would like to be able to send a BCC email to all active addresses. I am unable to perform this function through the macro or code builder option. Can you advise? 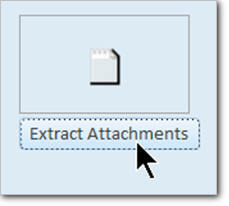 The attachments is just another property of the email, you can choose to add or not, the emailing still works the same. contactEmail = contactEmail & rs!Email & ";"
MsgBox "No email addresses available"
This code (if it worked) would send to all my contacts, which is not what I'm aiming for, but I would put in a proper query is I could get this off the ground. Thanks! This will clear all your looping work. If it's easier to follow make a string with all the To people in your loop, then set your .To to your string at the end. You can then Debug.Print(string) in various places when testing. OMsg.Subject = "This is the subject"
OMsg.Body = "This is the body"
How did you create the button event? 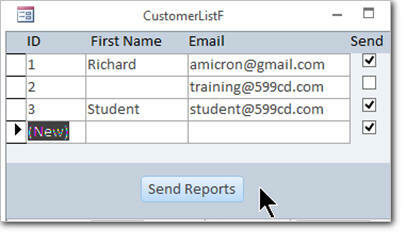 If you open the Form in Design View, click on the button and open the Properties Sheet, is there an event in the Click? You need to link the button to the code, it may not be. If you but a breakpoint in the sub does it hit? Kristin Williamson on 7/11/2017: Access Email Seminar: Regarding Lesson 2 - I set the Edit Message command to "NO" in the macro, but the email does not get sent out of my outbox. No errors either, pressing Send/Receive while in Outlook does nothing. Using Access 2010 and Outlook 2010. Does the Sample db work? If you set it to YES does it popup to allow you to edit? Is the code being called? 2. Theres a note to find it in an actual lesson "Watch lesson 29, about 7:24 into the video", there are links at various points on that page with the dbs to download. Kristin W on 7/20/2017: Alex, Thanks for your help. Shortly after I sent you the email I realized where the sample db was. I will check the code to ensure I'm not missing anything. Kristin Williamson on 7/24/2017: (Email seminar - Lesson 12 - 07:14) - I am having a problem with gmail code. I am duplicating Richard's code but of course, using my username and password. "transport failed to connect to the server". Unfortunately, I can not connect to the source page link (keep getting error 'must be logged in', but I am logged in). Have you changed the Security settings in GMail? I'm sure it needs to be set to a lesser level, make sure you are comfortable with this. Kristin Williamson on 8/11/2017: Regarding Lesson 21 - BulkMailF Total # of Emails in the OnOpen event does not work. It always returns the total number of people in CustomerT. This is because the default MsgRecordSource = CustomerT. I remove the default and get an error. Your sample DB also has the same error - any ways around this? I'll need to check the sample db when I'm not on a Mac, been a while since I've done this Seminar. Is another Table used to get Email Info, you could switch it to that one instead? I have applied the Email and Imaging Seminar methods into a very successful database to log where, when, and why an equipment process is interrupted. When we have an interruption, we assign Plan of Action items to individuals, each receiving an email notice of what they need to know. What I do not have is a method to send an incident notice to a group where the email includes the multiple recipients on the one email. You mentioned in the seminar we might not want everyone to see who is receiving the email; in this case, we encourage brainstorming and multiple replies from everyone. Thank you, I would like to say I find this leaning method very useful. There are multiple properties to the Email object [.to, .cc, .bcc] if memory serves, you can split those by ";" to send it to multiple people like you would in a normal email program. Give it a try with the .Display instead of .Send to see if it works. If you have a list of email addresses just loop them and build a string and pass that to the above property. Depending on if you want them as the main, cc or hidden from each other. If it's a DLIST just use that name instead. Thomas F on 11/16/2017: Thank you for your seminar and responding to the earlier post. I now have the group email I wanted. 'Code will not pass this point. contactEmail = contactEmail & rs!AddressEmail & ";"
Rich showed a video recently where controls on a form would be parsed by access in a string but what version of Access are you using? Do you have anymore of the error message? Sean Kelly on 6/25/2018: What if I want to use the replace function, but not send the email to a group of people, just one? Is there a code for that? I don't want the code to loop through multiple people when I replace information for a particular recipient. George Bowyer on 8/5/2018: I am getting a Runtime Error 440 on Set OMsg = nothing. Object does not support this method. Do any of the SET commands work? Formatting! If you drag on a new Field it has the default formatting and properties, most of which have likely been changed so you then only need to update the source and nothing more. George Bowyer on 10/18/2018: Thanks. This code works fine for selecting a different outlook account. George Bowyer on 10/20/2018: When I send the survey out, it is arriving without any carriage returns in the plain text message; ie: the "form" is all on one line of text.